Remote radio control of critical plant and machinery requires rugged hardware and reliable electronics. T-Series belly pack transmitters have been engineered for versatile wireless control operations in hazardous (classified) locations and extreme environments—including offshore drilling rigs and production platforms, oil refineries, chemical plants, and associated loading terminals. Safely control cranes, loading booms, winches, pumps, conveyors, tracked machinery and other mobile equipment, while allowing the operator complete freedom of movement and oversight. T-1 Belly Pack for more modest requirements. Each T-Series belly pack controller is custom built to order using control elements, indicators and displays from a selection of pre-qualified components. These include toggle switches, rotary switches, joysticks, potentiometers, paddles, LED indicators, LED and LCD displays. Other custom choices include colors for the control panel and labels. Both U.S. and International license-free models are available with line-of-sight control distances of up to 500 ft / 152 m possible in standard mode, and 1,500 ft / 457 m in U.S. extended mode. Operation is on the 902 – 928MHz ISM band for the U.S. models, or 2.4 – 2.4835GHz ISM band for international use. The frequency hopping spread-spectrum (FHSS) transceiver uses two-way communication for maximum reliability and safety—uniquely paired with one of our 16 or 32 channel receivers for digital and proportional control. 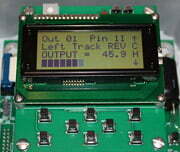 Machine status inputs to the receiver can be displayed on the transmitter. Ergonomic design enables comfortable operation over extended periods. The T-0 Jumbo Belly Pack has padded wrist supports and an included full torso harness for the operator, while the lightweight T-1 Belly Pack comes with neck and waist straps. Built to intrinsic safety standards without the need for an explosion proof housing results in minimum weight and bulk. Factory Mutual approval enables operation in Class I, Division 1, Group C&D hazardous areas. These fully portable controllers are powered from commonly available alkaline D cell batteries* contained within the housing—no separate battery pack or power cord required. *Duracell MN1300 to satisfy FM approval. Batteries must be replaced in an unclassified location. Housing: high-impact urethane, Polane urethane paint finish. Steel guard plates: plated or powder coated. Handles: stainless steel, rubber insulated. 14.5 x 8.5 x 7.625 in. 7.75 x 5.25 x 6.5 in. 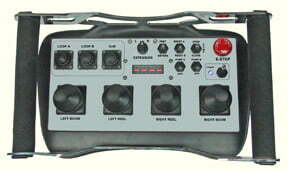 R-Series radio receivers provide up to 32 channels for controlling electrical, hydraulic, and pneumatic systems. Outputs can be configured for any combination of digital (bang/bang), proportional current, ratiometric voltage, or unamplified signals such as 0-10V. 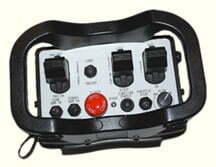 Depending upon model, the configuration can be done on board via push buttons and LCD display, or factory set to order. 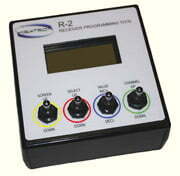 Model R-2 can be provided with an optional programming tool for fine tuning—perfect for OEMs. All versions can also be factory programmed to perform a wide range of logical functions and sequences. Automatic out-of-range fail-safe operation returns outputs to a safe condition. A normally-closed E-stop output is also available. 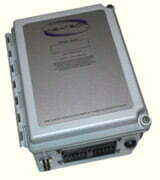 Monitored receiver electronics disables outputs in the event of a fault condition. Transmitter and receiver pairs are “married” to permit safe operation of multiple radios in the same general area without mutual interference. The marriage is accomplished by simply pushing a “learn” button in the receiver unit. Spare channels can accept input information to be displayed on the belly pack transmitter for operator feedback—up to 16 channels in the case of the R-1 and R-2, up to 7 channels for the R-4. Popular voltage ranges suitable for reading sensors and switch contact status can be monitored, and provide the operator with confirmation that critical actions have been accomplished. Receiver housings are designed for harsh environments and sealed to IP66 or 67. Additional secondary enclosures are required for installation in a hazardous classified location—consult Exloc for help with your specific application. Electrical connections are made using included environmentally sealed Deutsch multi-pin connectors with wiring pigtails. Ratiometric: 25% to 75% of supply voltage, 100mA max. Onboard push button & backlit LCD interface with menu lock. Factory only, but optional programming tool available. 8.36 x 6.88 x 4.38 in. 5.24 x 4.63 x 1.48 in. Optional: BNC connector, external antenna & cable kit.